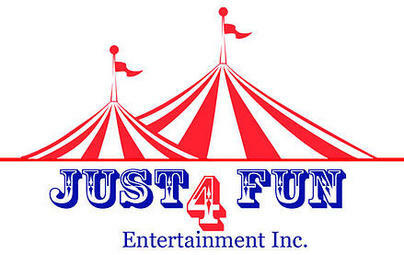 Just 4 Fun Entertainment, Inc. has been servicing the Hudson Valley since 1995. Since then, we have grown from humble beginnings renting bounce houses, into a full service entertainment company, thanks to our loyal customers! Just 4 Fun takes great pride in going above and beyond our customers' expectations. With over 20 years experience our main focus remains on quality and safety. The quality of our company is apparent in our equipment, which is handpicked from the best manufacturers. Our professional well trained staff, flexible rain policy and proper insurance provide our customers with a peace of mind at their events. Together with our sister company, Cartwright & Daughters Tent & Party Rentals, we can provide everything you need from tenting, tables & chairs to kid bouncers and clowns. Our event planners look forward to helping you plan a successful event... big or small!!! We service Putnam, Westchester, Dutchess, Fairfield, and Eastern Orange County.